Not one, but two July Degustations! Bastille Day is a great reason to celebrate all things French. So, we have decided to hold not one, but two French Degustation Dinners! 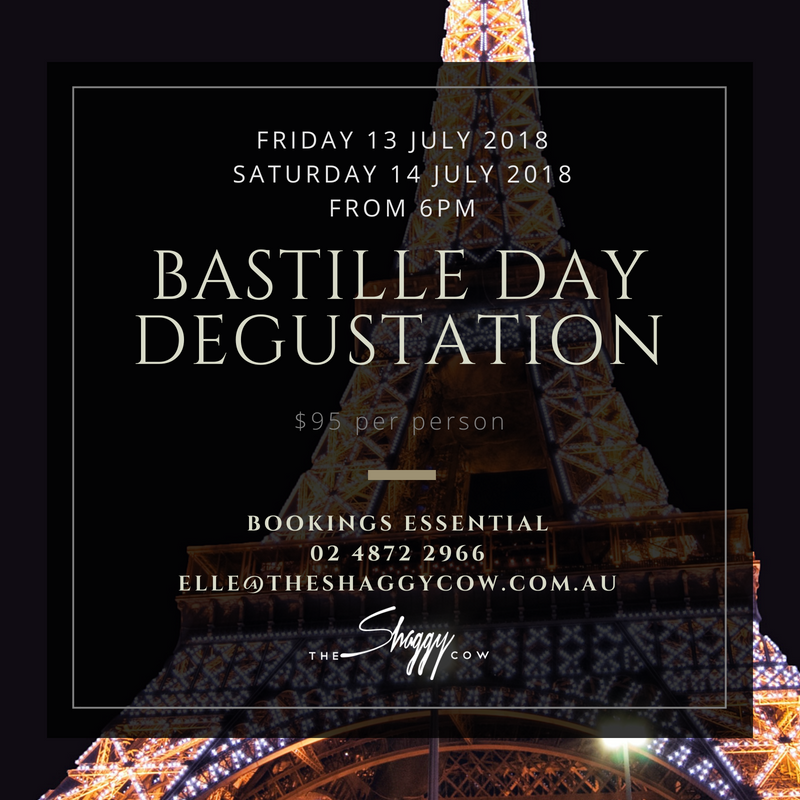 The menu looks amazing and our talented chef, Jerad, can't wait to share his passion of French cuisine with you on Friday the 13th of July and Saturday the 14th of July, 2018. If you are interested in joining us, be sure to book your table quickly to avoid disappointment. Australian Good Food Guide | READERS CHOICE AWARD WINNER!!! We received a plate rating! At the recent 2017 Savour Australia Restaurant and Catering Hostplus Awards for Excellence, we were fortunate to be a Finalist in two categories, Cafe Dining and Breakfast Cafe. We were not the winner on the night, but we were ecstatic with the actual results we received, and now, our 4-PLATE RATING! Again, in both categories. The Shaggy Cow (and Mittagong) was featured on Channel 7's Sydney Weekender on the 28th of May, 2017. Watch Segment 3 and the end of Segment 4, for the fantastic coverage by the Sydney Weekender team. What a privilege! A Highlands cafe has been named Best Cafe at the Australian Small Business Champion Awards. The awards were held on April 1. The Shaggy Cow was one of 10 finalists in the cafe category. Co-owner Elouise McCallum said it was the first time the cafe had been nominated for the award. “We were very excited. We hoped we would win but we didn’t think we would,” she said. Ms McCallum said the business had always focused on customer service. She said she and co-owner Mark Wilson invested time in training staff in order to provide top quality customer service. The Shaggy Cow has just over 20 staff. “We’re just really excited. It’s fantastic for the Southern Highlands to have a winner in that category,” Ms McCallum said. “We hope it brings attention to the area. The awards aim to recognise outstanding small businesses and encourage high standards of excellence in small business practice. Managing director of Precedent Productions and founder of the awards Steve Loe said it was a great way to acknowledge the hard work and contribution of small businesses across the country. “The Australian Small Business Champion Awards is a way to recognise the efforts of small business people whose efforts contribute to the prosperity and vitality of communities across Australia,” he said. Other Highlands businesses were also nominated at the Australian Small Business Champion Awards. Wembley Road Preschool was a finalist in the childcare category and The Holiday Rental Specialists was a finalist in the tourism category, however neither business won.